Long time no talk! My husband and I moved this month (still in Ottawa, just to a different apartment), and the holiday season was busier than ever! But I really want to get back into blogging in 2017, and there's no better time to start than New Year's Day, right? Last year I shared my New Year's Resolutions, and I have to say that I stuck to quite a few of them! 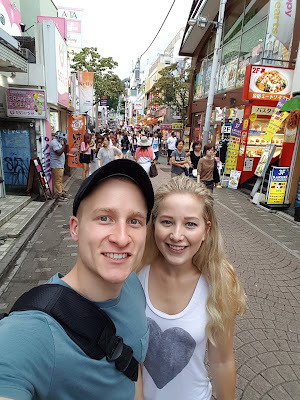 I shared quite a few What I Ate In A Day posts, I went completely cruelty free, traveled to Japan, and I stopped drinking Coke (and all other pop) entirely. However, there were a few goals that I didn't quite accomplish, including getting in shape, reading more, and oil-pulling (I got over that fad pretty quickly). I've been thinking for the past few weeks about what I want to accomplish in 2017, and I thought I'd share my resolutions and goals with you today (putting these goals out there helps me to stay accountable!). Yes, you read that right! I've been thinking about getting scuba certified for at least 6 years now, yet I always find an excuse to delay taking lessons. It seems like every year I look at the course schedule at the same school, but 2017 will be the year that I actually take the leap (or dive). I used to be such an avid reader, but then university killed my passion for reading. I'm trying to start reading again for fun, as I do still enjoy it. Right now I'm reading The Art of Racing in the Rain by Garth Stein which my mother in law lent to me, and I'm really enjoying it so far! My goal is to read at least one book a month, so if you have any book recommendations please send them my way! We just moved into a really nice apartment, and I'm inspired to put effort into interior decorating for the first time ever. Our last apartment was definitely a starter, and we didn't plan on being there for too long, so I never took the time to do it up nicely. However now I find myself getting scouring the city for the perfect throw pillows and blankets to complete my living room aesthetic! This goal goes along with the last one. I really want to keep my new home clean, organized, and welcoming. I'm the type of person that works well in organized chaos, but I know that it drives my husband crazy. This year I'm really going to make an effort to do my fair share of the cleaning around the apartment, since I know that my husband will really appreciate it. I think that this one will always be a goal of mine. My husband and I enjoy travelling so much, and we make it a priority to travel internationally at least once a year. My top travel destinations for 2017 are Portugal, Poland, Denmark, and Finland. I also want to take a few weekend getaways this year, whether it be to Montreal, Kingston, Toronto, etc. Have you set out any resolutions for 2017? If so, I'd love to hear about them, so we can keep each other motivated and on track! I think the key to being successful with your resolutions and goals is to be realistic. Don't overwhelm yourself, and you should be just fine! Yes to Europe!! Responsibilities can come later on haha travel while you can!